TRSFC have the pleasure of welcoming back Adam Bennett as Head Coach of the Mens teams in 2019. Adam is a FFA/AFC B-Licence qualified coach with playing, captaining experience and is a highly regarded coach consistently performing at Brisbane's highest level of footballing competition. Adam will commence his A-Licence in 2019. Adam will be assisted by some returning and new faces as the team pushes for more success in 2019 to build on the club's recent achievements, including completing a historic premiership and championship double in 2017. Pre-season training/trials will commence in November with a full pre-season schedule already planned in preparation to take on the league in 2019. 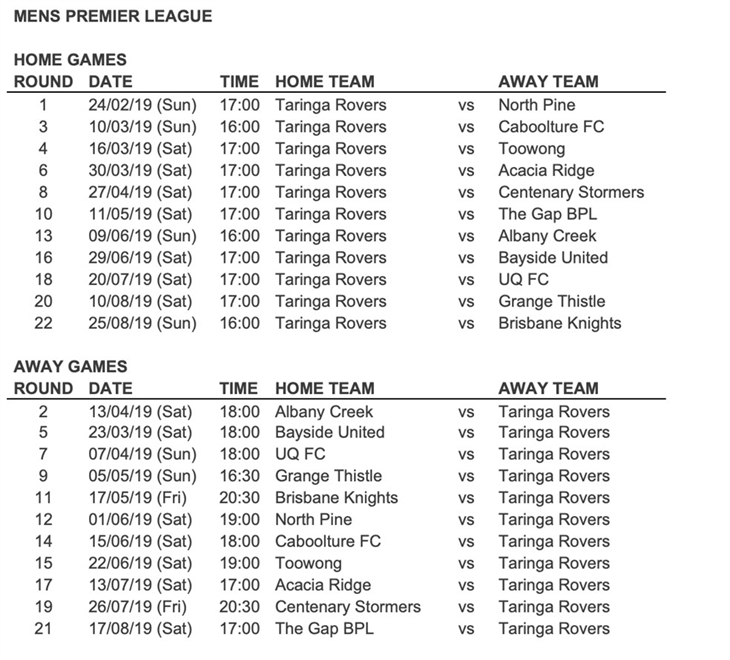 If you are interested in trialing and joining this squad, please fill in this form to register for trials or please contact seniors@taringarovers.com.au with a brief playing history including position, club, and level of competition previously played. Please be aware that players offered a position within the team are expected to train twice a week and must be available for games throughout the season. Please come along and support your Premier League team. Premier League Reserve games are scheduled to start 2hrs before the Premier League games listed below.